Sprouting may seem like a new trend, but it's actually an ancient practice. Far from a fad, this is something that our ancestors did to decrease “anti-nutrients” and toxins that are naturally found in many plants. Humans began cultivating seeds and grains somewhere around 12,000 years ago. (Note that 12,000 years is a veritable blip in our history...it is estimated that human evolution took place over a 6 million year time frame). Our ancestors, even those who began growing grains for consumption, probably ate far less grains, beans, and corn than we do today. They also had special preparation techniques for these foods. Soaking, sprouting, and fermenting were all very common ways of both preserving foods, removing toxins, and making them more digestible. As you can probably guess, anything that sprouts is a seed of some type of plant. Sprouting is simply allowing the seeds to start the germination process before eating them. What foods can and/or should be sprouted? Any edible plant seed can be sprouted. Beans and legumes, grains, and nuts can all be sprouted. Common foods we eat that can be sprouted before eating or cooking: peanuts, wheat, oats, corn, black beans, kidney beans, navy beans, garbanzo beans, peas, rice, quinoa, sunflower seeds, pumpkin seeds, and almonds – just to name a few! Anti-nutrients. Many plants contain anti-nutrients like phytates, lectins, and enzyme inhibitors. These are chemicals meant to protect plants and seeds from “predation” (they don't want to be eaten either!) and are often mildly toxic to very toxic to humans and other animals. Stomach pain, nausea, diarrhea, constipation, flatulence, bloating, fatigue, weight gain, headaches, skin irritation, and vitamin/mineral deficiencies can all be caused by consuming large amounts of plants and seeds that contain these biochemicals. Lectins, found in many plants but mostly highly concentrated in grains and beans, have been implicated as a major cause of gut permeability (leaky gut – think autoimmune conditions like rheumatoid arthritis, Chrohn’s, and Hashimoto’s thyroiditis). Phytic acid, found in many plants and seeds, binds with vitamins and minerals like calcium, magnesium, and zinc, potentially causing deficiencies in those essential elements. Exposure to lectins and phytates isn’t all bad. In fact, there’s plenty of evidence to support that these things have made our bodies stronger from an evolutionary standpoint. What doesn’t kill us can make us stronger, right? However there is such a thing as too much of a good thing, and the poison is usually in the dose. Up to 60% of the standard American diet is mass-grown and mass-produced soy-, corn-, and/or wheat-based processed food products. This means our exposure to anti-nutrients like lectins and phytic acid is likely much higher than what the human body is naturally equipped for. Sprouting may improve the nutrient profile of some seeds. Think about it: a seed contains all of the nutrients for a growing baby plant, but housed in an impenetrable shell that contains toxins (lectins and phytates), which could also be potentially harmful to the baby plant itself! 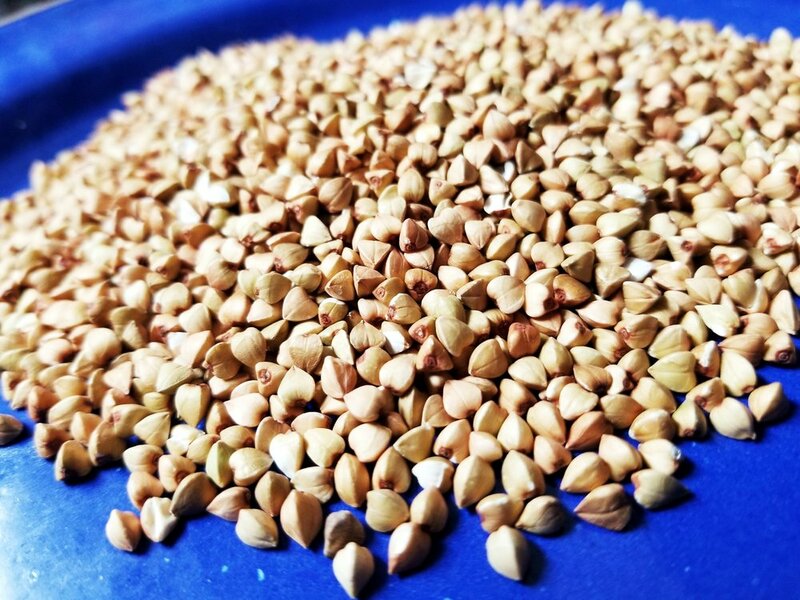 The process of a seed becoming a mini plant fundamentally changes the structure and chemistry of the seed making the nutrients available to the baby plant…and to us. Sprouting not only neutralizes phytic acid, lectins, and enzyme inhibitors contained within the seed, but certain vitamins, including vitamins C and B are shown to increase when a seed is sprouted! In my personal experience, the same type of “bodily distress” can be caused by quinoa, oatmeal, chia seeds, nuts, flax seeds, corn…you get the picture. The problem here isn’t anti-nutrients, but the type of sugar molecules that make up many seeds. These sugars are difficult for our body to break down, and while they aren’t necessarily harmful to us, they can certainly cause discomfort and distress…for us and anyone within a 50 food radius. Soaking and sprouting helps to break down these sugars, making the seed more digestible. Are there any reasons NOT to sprout? I’m glad you asked. All of the above info makes sprouting seem like the way to go, but there are a few things to consider before sprouting beans, grains, and seeds on your own. Many commercial seeds are treated with chemicals and sprouting inhibitors. These chemicals may break down during the sprouting process and actually become more toxic to you (and may keep your seeds from sprouting anyway)! If you are going to sprout beans, grains, or seeds, be sure to buy organic and non-GMO. Additionally, the environment in which seeds are sprouted (warm and wet) can also grow other bacteria. For this reason, there is some risk of salmonella or E. coli poisoning if proper precautions aren’t taken during the sprouting process (i.e. hands washed, sterilized jars). If you are concerned about bacterial contamination, simply cook your sprouted seeds before consuming. How do I sprout seeds? Sprouting is very simple, but requires time. Below you will find instructions for sprouting garbanzo beans. Keep in mind that different types of seeds may require different sprouting techniques, or may take more or less time to sprout. Do some research and ask Google if you are unsure! If you're making this hummus for a party, keep in mind that you need to start about a week ahead of time so that your sprouts are ready! Sprouting also makes a fun project for kids and they'll love to see the seeds "come to life" over the course of several days! Sterilize your sprouting container (I use a large Mason jar) and cheesecloth by boiling them for 10 minutes (I never actually do this step and we've never gotten sick…but I still have to add it here as a precaution…you assume all risks in sprouting your seeds!). Add your seeds (the word “seeds” refers to anything that can sprout, including grains and beans) to a colander and rinse with cool, filtered water. Pick out any stones or cracked/damaged seeds. Now it’s time to soak them for at least 12 hours (I usually do this overnight). Add the seeds to the sterilized Mason jar. Using filtered and unchlorinated water, cover the seeds with a ratio of 2 parts water to 1 part seeds (i.e. 1 cup of beans will need to soak in at least 2 cups of water). Allow to sit on your counter overnight. You will notice that the beans soak up a lot of water and will just about double in size by morning. In the morning, drain the water and rinse the seeds again. Now add them back to the Mason jar (do not add more water). Put the cheesecloth over the mouth of the jar and secure with a rubber band or hair tie. Now set the jar upside down at a 45 degree angle in a bowl or dish rack so that it can drain, but air can still circulate into the jar. In the evening, rinse the seeds again by running cool water through the cheesecloth, swishing it around, and then draining. Again, set the jar upside down at a 45 degree angle and allow to drain. Directions: Add the garlic, tahini, and oil to a food processor or high speed blender. Pulse until mixed well. Add all other ingredients and blend on high until as smooth as possible. If it seems too thick you can add extra oil or even a little water. Season to taste and adjust more salt/spice/lemon if desired. Drizzle with a little extra olive oil and serve immediately. Store leftovers in an airtight container for up to 5 days. Recipe note: If you are accustomed to eating store-prepared hummus or making hummus with canned garbanzos, there can be a slight textural and taste difference when using raw sprouts. Have you ever sprouted seeds? What are your favorite recipes? If you tried this recipe send me a photo and I'll post it on my FB page! Are calorie counts on cardio machines accurate?